Mr. Mercedes – Where it all begins…. No doubt if you follow me on Instagram you are aware that The Bill Hodges Trilogy by Stephen King holds a very special place in my heart. 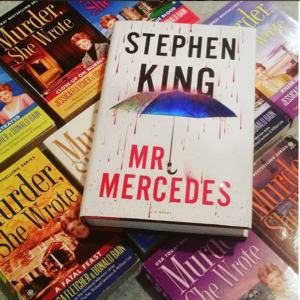 As I have never reviewed the books here on my blog, I figured I would start at the beginning with a quick review for Mr. Mercedes. The first book of the Bill Hodges Trilogy, Mr. Mercedes, is a fast-paced crime thriller with the most dangerous villain I have read in a while. Brady Hartsfield is smart, deranged and so easy to hate. Along with his truly vile mother, Deborah, these two will leave your stomach churning. Brady is so creative in his wickedness it isn’t surprising it takes three books to tell his tale. This book sets up the rest of the trilogy well and does a splendid job introducing us to our humble hero, Retired Detective Kermit William ‘Bill’ Hodges, who along with his neighborhood friend, teenager Jerome Robinson, work diligently to nab the ‘Mr. Mercedes’ killer. Closer to the end, we are introduced to Holly Gibney, the emotionally damaged cousin of Bill’s short-term girlfriend, Janey. Holly, throughout the course of the series, turns into one of my favorite characters – loyal, intelligent and snarky, Holly often provides a bit of humor and insight into the stressful, violence filled storylines. Jerome, as well, is quite humorous and him and Holly’s personalities play off each other quite well. Although different from the vast majority of King’s works, I am so in love with this trilogy that I rave about it often. The books are tied together in such an odd, yet seamless way, that it is nothing short of brilliant. King definitely knocked this one out of the park – the series gets better and better and is one-hell of a thrilling ride! Next > Another great thing about 2017….